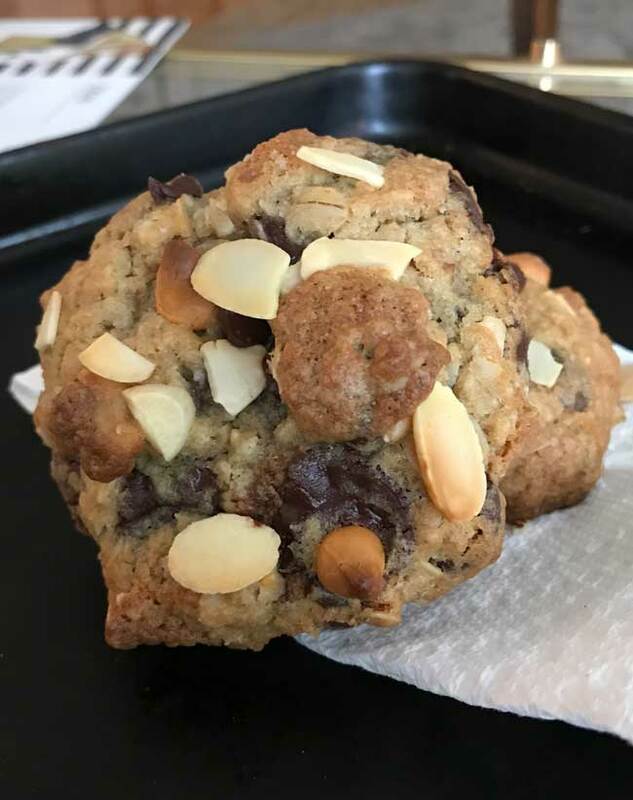 If you are looking for a cookie that keeps well but aren’t interested in recipes calling for shortening or vegetable oil, these Nutty Oatmeal Chocolate Chunk Cookies are made with butter and stay surprisingly fresh tasting on day 2 and 3. In fact, years ago I made these for a friend stationed in the Middle East. After reluctantly sending them overseas and worrying they wouldn’t taste good after the journey, I got a report back that the troops loved them. Through the years I’ve played with the recipe by mixing and matching different kinds of nuts and chocolate and experimenting with various flours, my favorite being a mix of bread and all-purpose. 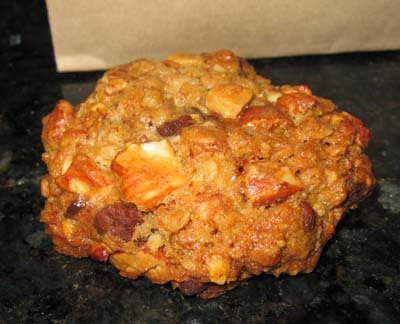 The cookies have a lot of sugar, but it’s offset by the nuts, oatmeal and unsweetened coconut. The recipe also calls for cinnamon which gives the cookies a little something when used in a very small amount. For the nuts I usually roast whole almonds and chop them up, but for this latest batch I used a mixture of whole almonds, sliced almonds and walnuts. Here’s another lovely old photo from my pre iPhone camera days. And here’s the updated recipe! Feel free to make changes, but one change I don’t recommend is taking out the nuts. If you are looking for a good oatmeal chocolate chip or oatmeal chocolate chunk cookies without nuts, my favorite as of late is Barbara Bush’s Chocolate Chip Cookies recipe. 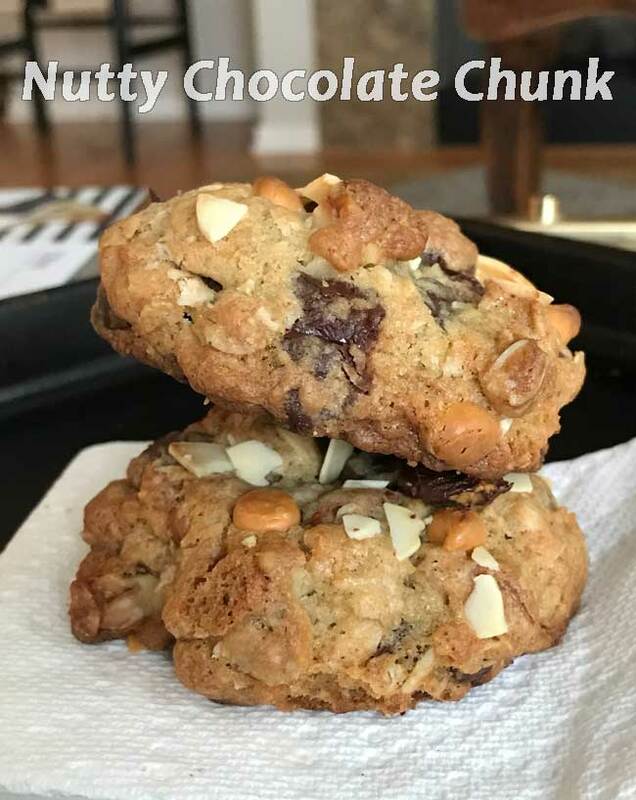 Nutty Oatmeal Chocolate Chunk Cookies are thick oatmeal cookies with lots of nuts, coconut and chocolate chunks. These cookies are very thick and keep well. 250 grams of flour. This is about 2 cups of sifted AP, but I recommend weighing. Also, I like using a mixture of half bread flour and half all-purpose. In the bowl of a stand mixer with a paddle attached, beat the butter until creamy. Add sugars and beat for about 4 more minutes, scraping the bowl often. Add eggs one at a time and beat until just blended, then beat in vanilla, baking soda and salt, scraping bowl often. Add flour and mix at low speed until just blended. Stir in oats, coconut, chocolate, and nuts. Using a 1/3 cup measure as a scoop, scoop up about 18 mounds of cookie dough and set on a plate lined with plastic wrap. Mold each mound into a compact ball and then flatten slightly. Chill flattened dough portions overnight or for as long as you can stand to wait. If you are in a hurry, you can skip the chilling, but the cookies are better when made with chilled dough. When ready to bake, place on parchment lined baking sheets. Arrange oven rack so that it is in the top third of the oven, and bake the cookies for about 15 to 18 minutes at 375. Alternatively, you can just bake at 350 for slightly longer or at 325 for 20 minutes. I sometimes find that baking cookies in the higher part of the oven at a higher heat makes for thicker cookies, but ovens vary. You can leave the cinnamon out if you prefer. I normally don't like cinnamon in chocolate chip type cookies, but in this case a little tiny bit of it enhances the cookie. If you want a more pronounced cinnamon flavor the cookies are still good with up to 1/2 teaspoon. Also, if you are using a phone you can just tap the picture and the red save button should appear. I’d love for you to post it ! To post it on your account you just move your cursor over the photo. A little Pinterest “Save” button should appear in the top left corner and it will open to your account. Please let me know if this doesn’t work for your for some reason. Also, the search bar is near the top of the right column underneath the little blue icons. Sounds yummy? Can I pot this right to my Pintrist account? The Pintrist linc at the top of the recipe goes to your account. Usually it goes to my account when i want to save a recipe. I could not find it on your site. Do you have a search bar? Thanks!